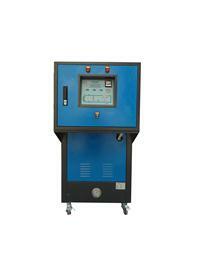 The high-gloss steam mold temperature controller employs high-gloss steam. When high-gloss steam is blown into the clamped injection molding machine, it is necessary to increase the mold’s temperature to a set value before conducting plastic injection into the mold cavity. After the injection molding machine finishes the pressure maintaining and starts the cooling procedure, cooling water will be injected then. Mold opening will start after the mold’s temperature drops quickly to a set value, and air will be blown into the mold to remove the cooling water thoroughly, thus finishing the entire injection. The Company’s newly developed high-gloss mold temperature controller has a high-gloss steam mold temperature controller and a cold-water pressurizing system and the extra designed hot/cooling water recovery system, promising outstanding energy-saving effect and great profit. It is the advantage of Aode superheated water high-gloss mold temperature controller. At present, it enjoys extensive application prospects in industries like household electrical appliances, automobiles, communications, articles for daily use, and medical instruments. Particularly, it is widely applied to LCD TV sets, computer LCDs, notebook PCs, mobile phones, air-conditioners, auto LCD, automobile internal ornaments, car lamps, photic, OA and AV instruments, etc. With the higher and higher requirements of people for electric appliances and electronics, their requirements for the appearance of relevant plastic shells are stricter and stricter. Generally speaking, the method to make up the surface defects of plastic products is follow-up spraying, which will make products less environment friendly. Remove the welding wires and welding traces on product surfaces. Improve the fluidity and filling effect of plastics. Enhance the product surface as smooth as a mirror. Leave out the follow-up surface spraying processing and treatment of products.